Besides writing about tons of furniture makeovers I’ve completed, I’ve also written multiple posts pertaining to painting in general: my favorite tools for painting, what kind of topcoats to use with what kind of paint and on what kind of furniture, my best painting tips, how to use a paint sprayer for furniture makeovers, and what kind of paint to use on what surface. As I said in one of those more recent articles though, there are always still questions. I’m totally not complaining about that! I love answering your painting questions to the best of my ability because painting furniture, walls and essentially my entire body in the process is something I enjoy. These painting questions are ones I get pretty regularly. I thought it might help to put them all in one place. And if you have a question that isn’t answered here, please leave it in the comments and I will respond to you as well as add it in this post. Let’s do this thang! Q: Can I use oil-based paint in a paint sprayer? A: With the paint sprayer I use, a HomeRight Finish Max, you can use oil-based paint in it. You just need to follow the instructions on the paint can as to how to thin the paint. Also, I have tutorial here on how to use a paint sprayer. Q: Can I paint over oil-based paint with a latex-based paint? A: Based from my experience, I wouldn’t do it. I’ve tried this before and it has just never ended well. I’ve heard of some people having success with sanding the finish, priming it, then going over it with latex-based, but I’ve never had much success with it. If you really want to try it, I would suggest doing it in a small spot first and seeing how that goes. Q: What type of topcoat/sealer should I put on my kitchen cabinets? A: If they are stained or painted a dark color, go with a polyurethane. If they aren’t stained, go with a polycrylic. Polyurethanes have a tendency to yellow over time and polycrylics don’t. It should be said though that polyurethanes are tougher in terms of protection than polycrylics. 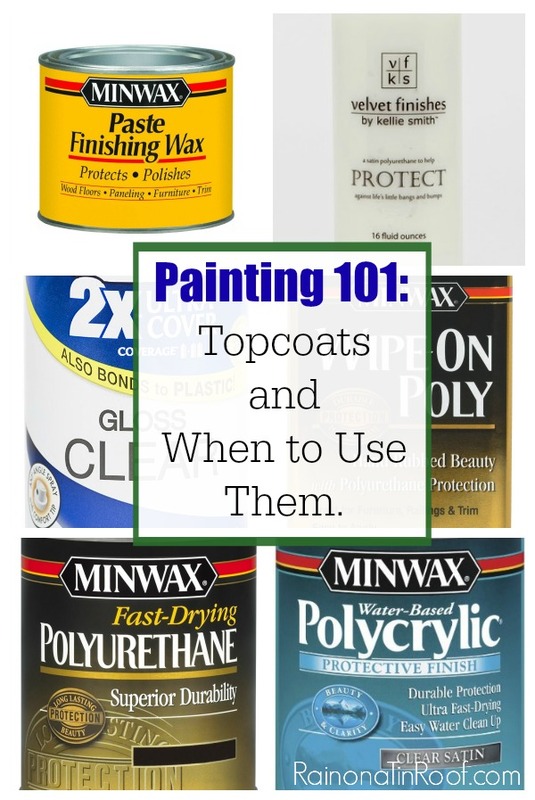 Also, here is a guide for determining what kind of topcoat to use on what. Q: Do I need a topcoat on top of a satin or eggshell paint? A: Yes. Unless you used a semi-gloss paint, you usually always need a topcoat with flat, satin or eggshell finishes. You can use a polycrylic in a satin finish to keep the piece from having too much shine. Q: I painted my piece of furniture and put a topcoat on it. I put it back in use and a few days later, I grabbed a magazine off it I had placed there and it seemed like the magazine had to be “peeled” off the furniture. It even left a little of the ink from the magazine on the table. What happened? A: The paint and/or topcoat didn’t have enough time to fully cure. Some paint jobs can take weeks to fully cure, especially if you are in a high humidity area. After your paint and topcoat have dried to the touch, you can move it back into place. I suggest letting it sit “undecorated” though for at least a week. If it has drawers or doors, leave those slightly open as well to let them fully cure. After a week, lay a magazine on top of the piece for a few hours and close the doors/drawers. If after a few hours, everything is removed and opened without sticking, you should be good to go, if not, let it cure longer. I’m in Tennessee and if I makeover a piece of furniture during the summer, I tend to wait as long as possible before decorating and fully closing the doors and drawers on it. I will wait usually at least two weeks. Q: After painting my piece, I noticed little tiny bumps in my finish. What happened? A: Those little bumps are little bits of dust and dirt most likely. Before applying paint to your piece, always be sure to wipe it down well with a tack cloth. 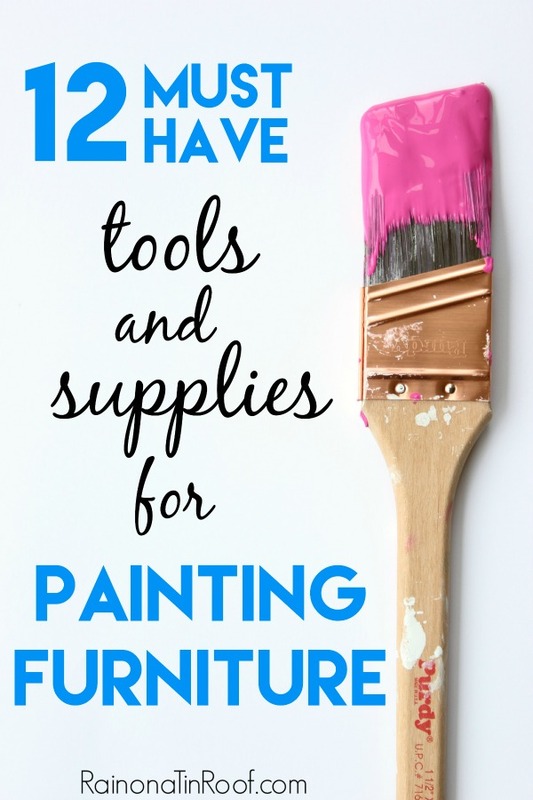 Paint your furniture in places where there isn’t much dust flying around as well. If you have a shopvac, then it’s a really good idea to vacuum the piece after sanding it, then going back over it with a tack cloth and finally painting it. Q: What can I put over a piece of furniture if I want to add photos to the top of it? A: Mod Podge works well for this. First, apply Mod Podge to the surface where the photos will be placed, then put the photos on top of that and finally put another coat of Mod Podge over the photos. I would suggest doing at least two light coats of Mod Podge on top of the photos to really protect them. 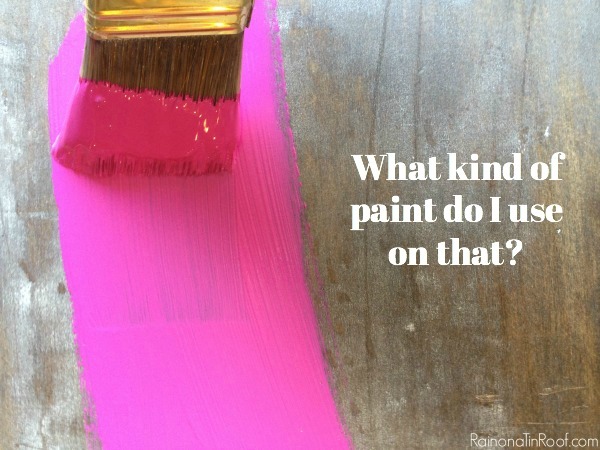 Q: What kind of paint do I use for trim? And what color(s) do you use or have you used? A: Always use a semi-gloss or gloss for trim. They will be much more durable and easier to wipe clean than flat, satin, or eggshell finishes. In the 70’s Landing Pad, I’ve used Limousine Leather and Bit of Sugar, both by Behr and both in semi-gloss finishes on the trim. In our Beloved Foreclosure, I used Crumb Cookie by Valspar, but had it mixed in Behr paint. Q: What kind of paint would I use on a brass/metal fireplace surround? A: Once more, I’ve never done this, but I know that Rust-Oleum makes a high-heat spray paint that I think would work well for this. Just be sure to keep the paint out of the actual fireplace. Have more questions about painting? Please leave them in the comments below and I’ll respond to them there and add them to this post. What Kind of Paint Do I Use on That: A guide to the types of paint you can use on various surfaces. Hi Janet! I haven’t done a furniture painting class, so I think you might have me confused with someone else. 🙂 But, I think you might could go over that with a darker stain. If I were you, I would try it in an inconspicuous spot first and see how it goes. Hope that helps! You are welcome, Summer! Glad it was helpful! My new Max Pro is on the way and I will probably have a million questions when I get started haha. It has been a long time since I have used a sprayer, I even bought the tent to set up in my basement, so no matter the weather I can paint. I have so many projects I need to get done so maybe now I will. One question I do have, if you are going to paint an old piece and you don’t know what kind of paint is already on it, What do you do? Yay, Patty! I hope you love it! Good question. I would look at the sheen of it. If it’s glossy, to be on the safe side, I would just go ahead and sand it. You don’t have to completely sand the paint off, just give it some grit. Then come back with a primer and finally your paint. Most likely, it would be fine that way. I kind of figured that, but just needed you to confirm it, I don’t have the confidence I should have. Thanks so much, it is so nice to know we can ask you questions when we need to. Ok, I am totally new at painting furniture. I have a dining room table and chairs that is in terrible need of a makeover. I know the look that I want, but no clue with what paint to use. I think I have figured out I need a polycrilyc from your blog though, so it doesn’t yellow. Anyway, i want to paint it all an off white color and then sand the edges and do a glaze over the whole thing to antique it a bit. then of course I know I need a sealer/ top coat for at least the top of the table. so what type of paint and glaze do I use, and do I need to use the top coat on the entire table and chairs? Thanks for your help!! The only paint and glaze combo I’ve used is Velvet Finishes paint and their Enhance topcoat. They worked well for me. Definitely do a topcoat the table, you might be able to get away with not doing it on the chairs, but I probably would if I were you and the table gets a good bit of use! Hi! I found your guide very useful and informative about different paints to use on different surfaces. However, I have a major question to ask! I have marble stairs which I want to paint over and make them look colourful. Is it possible to paint a marble? What is the type of paint I can use? I did google search for the same and I found some info that I should first sand it, use an oil based primer and use oil paint, and finally seal with polyurethane. Since I found this guide very promising, I would like to take your advice. Thank you! Hi Roopa! I have not painted marble before, nor anything like it, so unfortunately I’m not much help here. Sorry! My white timber bed frame is looking yellow and I was going to repainted it white but thought I might paint it black for a change. My bedroom walls are white so I’m worried it will look harsh, unless I give it a ‘ old’ look. I don’t know if this look is in fashion so I’m open to suggestions. Also what type and.finish of paint would I use. I would use a semi-gloss black paint. You will probably also want to use a primer on it first! Hi: I have a dresser with a very slight grain in it. Can I get away with priming and spray painting it or do I need to sand it. I would like to get a smooth finish. I don’t think there is any polyurethane on it. It looks very raw. Are there paint products that will fill in the grain slightly. I think you could get away with priming and painting it, Pauline. If you want a really smooth finish though, you’ll want to sand it. hi, I just want to know that I can paint furniture with acrylic colours or not? Hello! Do you mean like acrylic colors you purchase at a craft store? If so, yes, I think you could. I recently purchased a chest of drawers, and had it painted an off white. I am not really fond of the color, so I’m thinking of repainting it. It is painted with a satin finish enamel. I would like to do a high gloss oil base enamel. Do I need to sand first? I would sand lightly or degloss just to get rid of any sheen and then repaint it. Thanks so much. I enjoy your site. I just bought a beautiful solid wood bookshelf that the previous owner painted with Rustoleum spraypaint, poorly. I’m having a hard time removing it with an orbital sander and a paint scraper. Any recommendations? Oh man. Spray paint is hard to sand. If you want to completely strip it, I’d suggest trying a liquid stripper or a heat gun, then repainting or staining it. If you could at least get an even surface with sandpaper, then I’d use a good primer after that, then paint it. Hey, thanks for the content I would love to paint the furniture and the blog is also very useful for me.great job. good luck. its a little bit tough to paint a furniture but I have just started hopefully will get expertise in it. this is probably a really dumb question but I have not seen it addressed anywhere and since I’m such a newbie I need to know, can I use my craft paint which is acrylic 2 paint and decorate wood frames and wood furniture such as chairs? Hi Cheryl! Not a dumb question at all! I think you could definitely use it on wood frames and could use it for designs or accents on your wood furniture, but I don’t think I would use it to paint an entire piece of furniture. Hope that helps!